I just discovered a cool fun Blog!! I can't reember how I stumbled upon it, but it's called We Digi-Dare You, and their first Digi-Dare is a fun one ~ you should check it out. Here is my LO for the dare from 2 years back when I took my 3 girls back East to the small town I grew up in. My brother still lives there with his wife & 3 kids, so we stayed with them & it was a very new experience for the girls. They were first very amazed at the number of trees the amount of grass. Then they couldn't believe the roads have no sidewalks or gutters & the houses are set back so far from the road! I hated growing up in such a small town (& most likely will not live in one again ~ I'm definately a city gal!) but seeing it with my girls, and their awe at how different I grew up from them, was priceless. 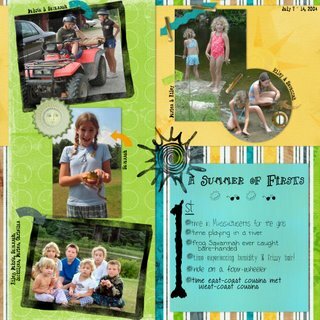 So on to the LO for the Digi-Dare You challenge ~ "A Summer of Firsts"
Lovely page - thanks for playing along with the dare!